Islay's legendary Single Malt distillery presents the Ardbeg Dark Cove Limited Edition 2016, a back in time travel in the turbulent past of the island, where smugglers used to hideway. Islay's legendary Single Malt distillery presents the Ardbeg Dark Cove Limited Edition 2016, a back in time travel in the turbulent past of the island, where smugglers used to hideway. Day turns into night and Ardbeg Day turns into Ardbeg Night for its new limited edition 2016, the Ardbeg's darkest: Dark Cove. Following Auriverdes et Perpetuum's editions, Ardbeg presents a new limited edition Dark Cove refering to Islay island's dark background, preceding John McDougall's first distillery in 1815. The island with its secret beaches and caves was used by smugglers for their unlawful activities. Ardbeg Dark Cove is a balance with a matured Ardbeg in Bourbon barrels and dark Sheery barrels. Ardbeg "Dark Cove" alludes to the historical cove where is now established the distillery. The cove used to be the smugglers hidout where they produced illegaly the valuable whisky, hidden in a cove whitch couldn't be reached by the coast. To join the cove, they had to wait for full moon, on a rowing boat loaded with peat, supplies, jars and barrels to reach the cove in the dark. 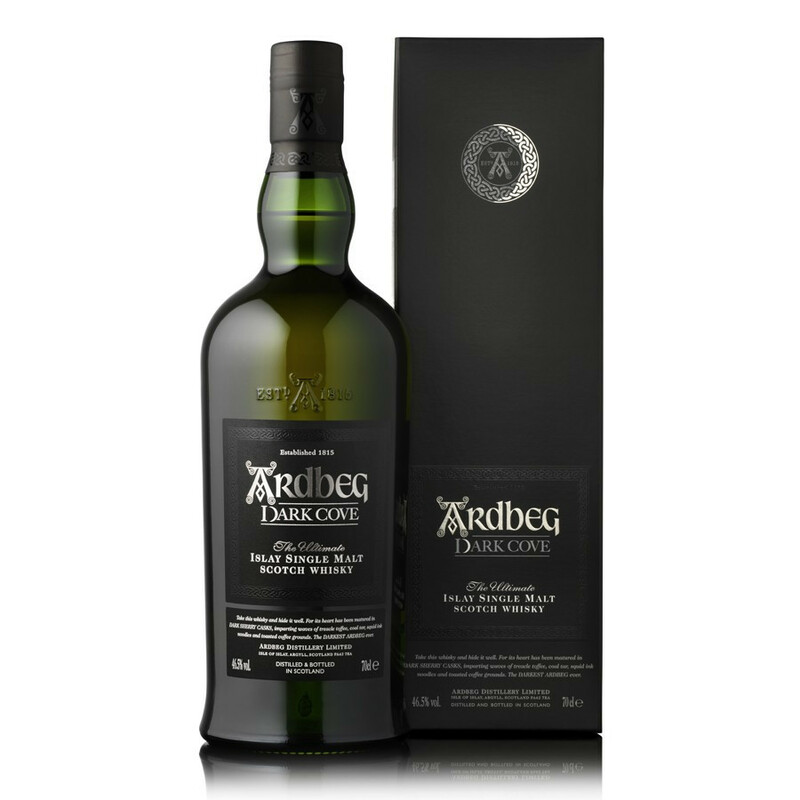 Ardbeg chose to limit Dark Cove 2016's edition, with two times less bottles available in France this year. Product not available for the moment. On the now famous Arbdeg Day, the distillery has launched a new 2014 limited edition: Auriverdes! Celebrating its 200th birthday on May 30, 2015, the Ardbeg distillery has launched its Ardbeg Day special release, Ardbeg Perpetuum, a 2015 limited edition. Ardbeg presents with Kelpie a peated Single Malt that has matured in new oak casks, made with cultured oak trees close to the black sea. Take and hide this whisky, its heart has been matured in brown sherry barrels, molasse sirup, resin, dry ink and ground roasted coffee. Ardbeg's darkest wisky. Nose: consisting shades, earthy and spicy notes at first. Then, shades of dark chocolat with molasses syrup, orange, caramel, coffee and oak. These shades reveal Ardbeg's secret, matured in Bourbon barrels and grown Sherry Barrels.Comes along a flowery note reminding the blooming of a blackberry bush and flaxseed oil. Palate: pushy spicy pepper notes and lemon zest, then charcoal and varnished wood burst in palate, following grappes, dates and ginger appears from the creosot resin. Smoked and salted ham with dry ink hosts the entree of a long final spicy note. Finish: long, spicy and rich with enduring caramel notes, coffee and glowing charcoal.